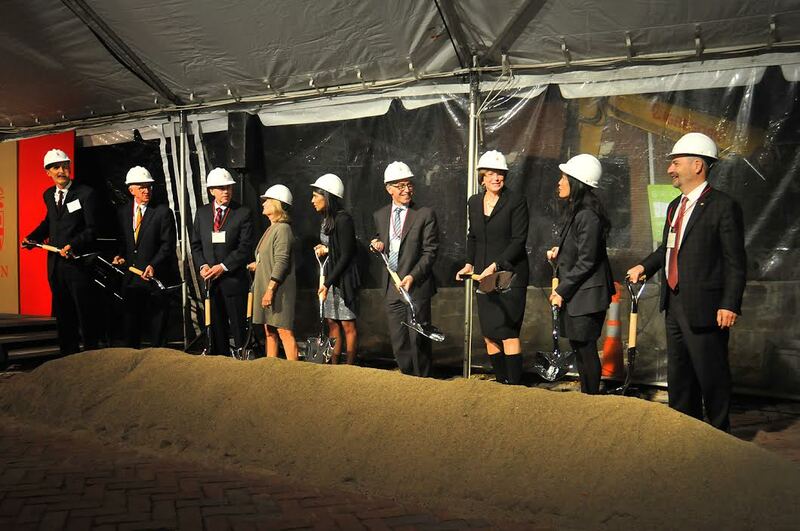 On Thursday, Oct. 22, 2015, Brown University broke ground on a new research building for its School of Engineering that will feature 20 laboratory modules designed to facilitate work by larger multidisciplinary research teams. The event was part of the celebration of the launch of the University’s comprehensive fundraising campaign. PROVIDENCE, R.I. [Brown University] — The oldest engineering program in the Ivy League has opened a new chapter in its storied history, as Brown University leaders, donors, and community members broke ground Thursday, Oct. 22, 2015, on a new School of Engineering research building. The groundbreaking was the first of a series of events scheduled for the launch of Brown’s comprehensive fundraising campaign, which will have its official kickoff with a celebration Friday, Oct. 23. One of the academic priorities of the campaign is funding for a theme articulated in Brown’s Building on Distinction strategic plan, “Using Science and Technology to Improve Lives.” This includes significant support for the School of Engineering. The school’s new three-story, 80,000 square-foot structure will include specialized facilities for nanoscale and biomedical engineering, along with two full floors of new lab space designed to expand cross-disciplinary research aimed at addressing the world’s critical problems and challenges. It has been designed by Philadelphia-based KieranTimberlake and will be built by Shawmut Design and Construction. A crowd of about 200 gathered on Manning Walk, the building’s future home, to celebrate the official start of construction on the facility, with completion expected in early 2018. Brown President Christina Paxson expressed gratitude to the donors who helped to launch the $88-million project. Planning for the new facility began in 2013 with an initial round of gifts totaling $44 million, including lead gifts totaling $35 million from Brown graduates Theresia Gouw and Charles Giancarlo, both of whom were on hand for the celebration. Guests at the groundbreaking learned that the School of Engineering has received additional significant support in early fundraising for the comprehensive campaign, including the University’s first endowed deanship. Larry Larson, who has served as dean of engineering since 2011, will become the Sorensen Family Dean of Engineering, thanks to a $10-million gift from Paul Sorensen, a 1971 Brown alumnus, and Joan Wernig Sorensen, a 1972 alumna and current Brown trustee. Early campaign gifts totaling more than $100 million have been designated toward the School of Engineering. Larson says he looks forward to a new building that reflects the nature of engineering research in the 21st century. Nanoscale research holds the promise of breakthroughs in medicine, materials, optics, computing, communications, and elsewhere, Larson said. Working at the tiniest of scales requires the most pristine of lab conditions. A state-of-the-art nanotechnology cleanroom in the new building will enable nanoscale fabrication and experimentation for researchers across campus. A second cleanroom, tailored specifically for biomedical applications, will expand Brown’s capacity to engineer artificial tissue and organs, neural implants, and tumor microenvironments to better treat cancer. During the groundbreaking ceremony, biotech entrepreneur and cancer researcher Sangeeta Bhatia gave a keynote address and spoke of the importance of engineering research and scholarship to human progress. 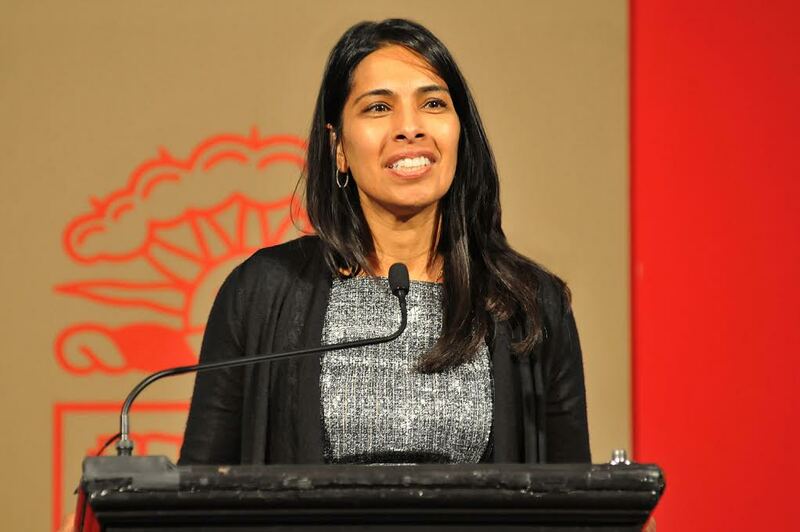 “What I learned at Brown as an undergraduate steered me toward a career at the interface of engineering and medicine, made me aware of the problems we face as a society, and the possibility of technological solutions,” said Bhatia, a 1990 Brown alumna and a Brown trustee. Bhatia is a professor of health sciences and technology and electrical engineering and computer science at the Massachusetts Institute of Technology, and a member of the National Academy of Engineering. “What we are celebrating is not just the birth of a building, but a new or maybe renewed respect for the place of engineering at the heart of Brown’s efforts to serve the world,” she said. Much care has been taken to ensure that Brown’s new engineering facility is designed to foster collaboration across disciplines, University leaders said. Brown is a place where fluid mechanists work with biologists to understand the intricacies of animal flight. Material scientists work with chemists and chemical engineers to study alternative fuel and energy sources. And engineers work with neuroscientists to find ways of overcoming neurological disorders and injuries. The building’s placement in the heart of the University’s College Hill campus also aims to encourage collaboration. It will connect on all three floors to the Barus and Holley building, existing home of engineering and physics. It will be flanked by the Division of Applied Mathematics and sit adjacent to the departments of chemistry, computer science, and earth, environmental, and planetary sciences. The first-floor lobby will be an open space equipped for lectures, presentations, and small public seminars. The aim is to create a flexible gathering space for students and researchers from all departments and disciplines. The new facility will be critical to the school’s undergraduate education mission as well. Student enrollment in engineering concentrations has grown significantly over the last decade. In 2007, Brown graduated 71 engineering concentrators. Based on current enrollment, that number will grow to 140 students in 2017. The new building will support that growth with a new teaching laboratory, enabling more course offerings that include a lab component. More flexible research space will expand opportunities for undergraduate research, a cornerstone of the school’s educational mission. All told, the new facility will provide a home for about 15 faculty members, 20 or more research associates, 80 graduate students and numerous undergraduate researchers. The new building will free up space for the engineering faculty, which is expected to grow from an estimated 50 scholars and researchers today to 60 during the next five to 10 years. Brown’s undergraduate program in engineering was established in 1847, making it the third oldest civilian engineering program in the country and the oldest in the Ivy League. The School of Engineering was established on July 1, 2010.